Subjects, styles, advertising, other relevant information: Photographic Artist, agent for Wheeler and Wilson’s sewing machines and agent for Suttons parcel conveyance in 1864. The Cambridge Independent Press reported on 12th November 1864 that Sarah Ann, wife of Samuel Leach, Photographic Artist, had died, aged 28. Kelly's Directory of Northamptonshire 1864. Cambridge Independent Press 12 November 1864. Subjects, styles, advertising, other relevant information: Leach & Son were local printers and stationers in Wisbech. They also produced local postcards. Not known at this stage if anyone in the Leach family was also a photographer or whether they used images from other sources. In 1851 John Leach (b:1807 Wisbech) was a printer, a master employing 3 men and 3 apprentices in the High Street Wisbech. John died in 1852 and the printing business was taken over by his wife Margaret, (b:1817 Clenchwharton Norfolk), who was still running the business in 1861 - the business then described as printer and bookseller employing 3 men and 3 boys. In 1861 John's son, also named John (b:1842 Wisbech), was an apprentice in Huntingdon. In 1871 John (Jnr) was a "printer &c employing 4 men and 4 young persons". He was living with his wife and a servant at 12 Crescent Wisbech. In 1881 John Jnr was at 26 High Street Wisbech, a "printer and stationer employing 3 men and 5 boys". He was also a Town Councillor. John's family comprised his wife Jane (b:1842 Wakefield, Yorks), daughters: Ethel M (b:1872), Edith Gertrude (b:1873), Constance M (b:1878) and sons Bernard H (b:1876) and John O (b:1881). All the children were born in Wisbech. They had two servants and a nurse. In 1891 John and family were still at 26 High Street, Wisbech, John was described as a printer and a Justice of the Peace. In 1901 John was living at 2 Sandringham Villas, Monica Road, Wisbech, a Justice of the Peace, printer and bookseller. He was living with wife Jane, daughter Edith and 16 year old son John (b:1885 Wisbech), who was an "assistant bookseller". John Jnr died in 1903. By 1911 John, the grandson, was running the printing business, living with his mother and sister Edith Gertrude at 42 North Brink, Wisbech. Subjects, styles, advertising, other relevant information: Nicholas Lee took over the Post Office Terrace Studio in Cambridge from Ramsey and Muspratt from 1978 to 1980. "Nicholas Lee of Ramsey and Muspratt" is listed in Cambridge Yellow Pages 1980. Address: 19 Kings Parade, Cambridge, 1970 onwards at 22 Derby Road Cambridge. Subjects, styles, advertising, other relevant information: One of the few professional photographers to obtain a prestigious Fellowship of the Royal Photographic Society as well as a Fellowship of the professional photographer's own body, then entitled the Institute of British Photographers, Edward Leigh has been described as a true artist with a camera. His photographic career spanned over 50 years. Before WW2 he worked as a fashion photographer and a stills cameraman for Fox Film Studios, later 20th Century Fox, working with such stars as James Mason. During the war his printing skills were employed by RAF Oakington to process at great speed the aerial recognizance photographs which were assembled into the mosaic maps used by Bomber Command. 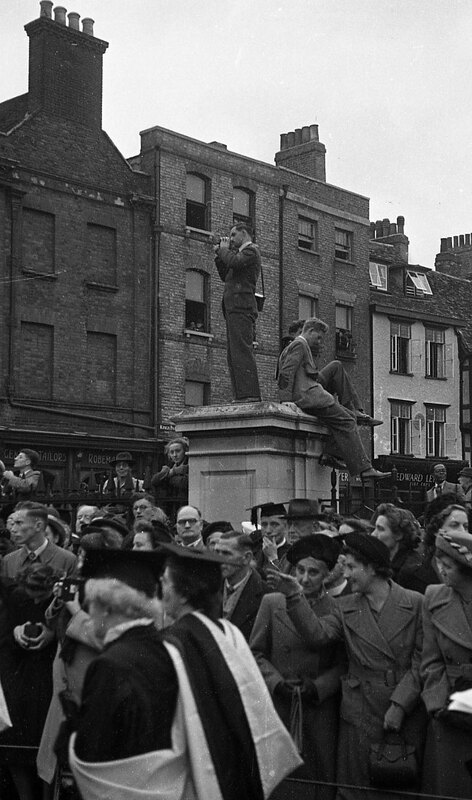 After the war Edward set up his own studio on Kings Parade in the centre of Cambridge, living on the premises. Edward did a great deal of work for University Departments and Cambridge Colleges, from groups of freshers to graduation ceremonies, visiting Royals to portraits of fellows and, one of his many favourite assignments, work for the Peyps Library at Magdalene College. Many of his architectural photographs have been used for decades in books on Cambridge. He was a much sought after industrial photographer, skilled in the use of lighting and good at composition, rendering many a mundane piece of machinery into a dramatic and sculptural beauty. He was described as "Tremendously fascinated by the things he photographed, - and sometimes not. He could dismiss a Picasso leaning against the wall of his studio with a derisory "Pshaw" but photographing an illuminated manuscript or the interior of Ely Cathedral's Lantern Tower from a precarious perch far above the nave would have him enthralled". Edward's daughter, Cheryl, recalls: "As children we were propelled into the Studio to gape at an enormous double helix of wires and little coloured balls (when DNA was first unravelled) as our excited Dad told us about atoms and molecules". Edward had a great interest in wildlife and nature. He was skilled in the field of micro-photography as well as wildlife cine filming. His many other interests over the years included metal and woodworking, an interest in clocks, and a long term love of small boat sailing, both on the Cam and the Norfolk coast. Again, daughter Cheryl recalls "Dad's great delight was portraiture. From dignified portraits of University luminaries to glamorous shots of women, he made people look wonderful. Perhaps he enjoyed photographing children the most because he could really let his hair down and give full reign to his surreal sense of humour. Parents would be banished and strange noises, funny voices and gales of childish laughter would emerge. Resulting photos captured relaxed, laughing children or little ones with eyes wide with wonder at this one man Monty Python show from behind the camera" Edward's employee, Frank Bird, recalls that Edward usually signed his portraits on the mount. Below is an image of the rubber stamp backstamp from the studio. In the 1960s Edward Leigh acted occasionally as a "stringer" for the Times Newspaper, providing photographs for local news stories. 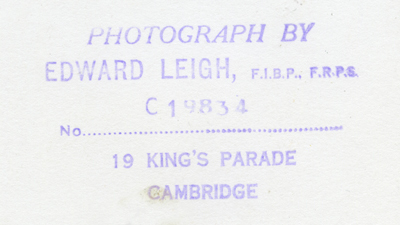 When Edward retired his son John Edward Leigh took over the business, still at 22 Derby Road, Cambridge, which he listed as specialising in advertising photography, for a short period around 1983-85, before the business finally closed. Working for Edward Leigh at different times were Doug Rattle, Peter Lofts and Frank Bird. Autobiography of Frank Bird one of Edward Leigh's employees. 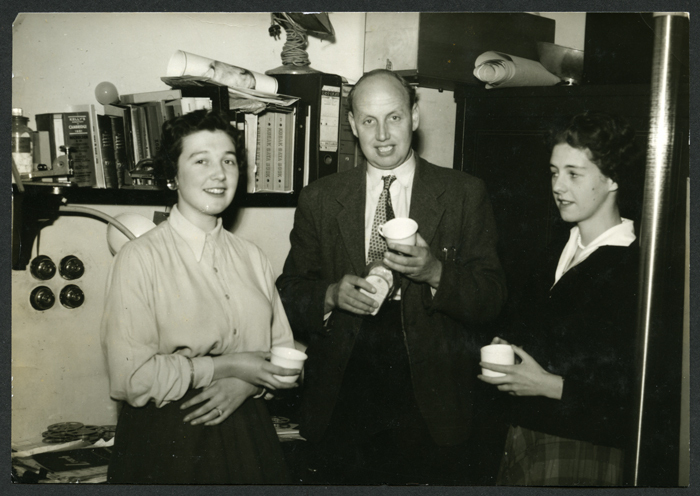 This 6in x 4in photograph (Frank Bird Collection) shows Edward Leigh with (L to R) Connie (receptionist) and Jean (printer) and was taken by Frank Bird. Frank recounts the occasion when this was taken. Frank had been deputed to attend an event at the Grosvenor House Hotel in London where he was to take shots of attendees - this necessitated approaching people at the event, chatting them into permitting a photo, posing them at their ease and deft use of the camera. Edward was talking him through the process and this small group was posing as possible clients at the event. There is still a touch of bitterness in Frank's final comment on this image: "Edward Leigh wouldn't let me hire a dinner suit for the occasion and I felt so out of place as the only person there in an ordinary suit"
Subjects, styles, advertising, other relevant information: John Edward Leigh took over the business of his father, Edward Leigh, around 1983. In the Cambridge Yellow Pages he listed his speciality as advertising. Subjects, styles, advertising, other relevant information: In the Cambridge Chronicle 14 September 1867 there is a report of celebrations on the occasion of the opening of the new Working Men's Institute in Wisbech at which prizes were given for artistic endeavor, one being won for a drawing by "William Liddell photographer". William Liddell's name is again mentioned in connection with art classes at the Institute in the Isle of Ely Gazette of 16 Oct 1869. So William Liddell may possibly have been part of this partnership, while for the moment Williams remains an enigma. Subjects, styles, advertising, other relevant information: See the press report below from 1856. George Lilley is described as a pupil of Mr Jerome, artist. It is not clear who Mr Jerome was. It is possible he was a locally known artist or, less likely a locally known photographer. Another possibility is the portrait artist Ambrosini Jerome, a pseudonym for James Parker 1810-83, portrait painter to HRH the Duchess of Kent. No trace has been found of a George Lilley artist / photographer in the 1851 census returns. The Cambridge Independent Press again favourably reported on George's talents on Saturday 30 May 1857: " Photography.—Our young townsman, Mr. Geo Lilley, seems determined to spare neither expense nor pains to perfect himself in the above art, if we may judge from the exceedingly beautiful portraits that emanate from his studio. We have of late had shoals of photographic artists here, but never have we seen such faithful likenesses as those taken by Mr. Lilley. His back-grounds are very pretty, and make a pleasing picture, and the likenesses stand out in first-rate style, so that the two combined have a splendid appearance. It is always a pleasure to speak of native talent, and we are glad that Mr. Lilley is well supported by his friends both in town and country." The Cambridge Independent Press on 26th January 1861 reported the death of George Lilley, photographic artist, aged 25. See below a press report on Lilley's work from the Cambridge Independent Press 15 Nov 1856 and 30/5/1857. Death reported in Cambridge Independent Press 26 January 1861. Address: Portrait Studio 12-15 Market Street, Cambridge, In 1990 had a Studio at 17 Mercers Row Cambridge; 14 Green Street, Cambridge by 1990. Subjects, styles, advertising, other relevant information: Eaden Lilley was a department store based in Cambridge, tracing its history back to a haberdasher's business in 1760. The photographic department undertook portraiture and other commercial photography. 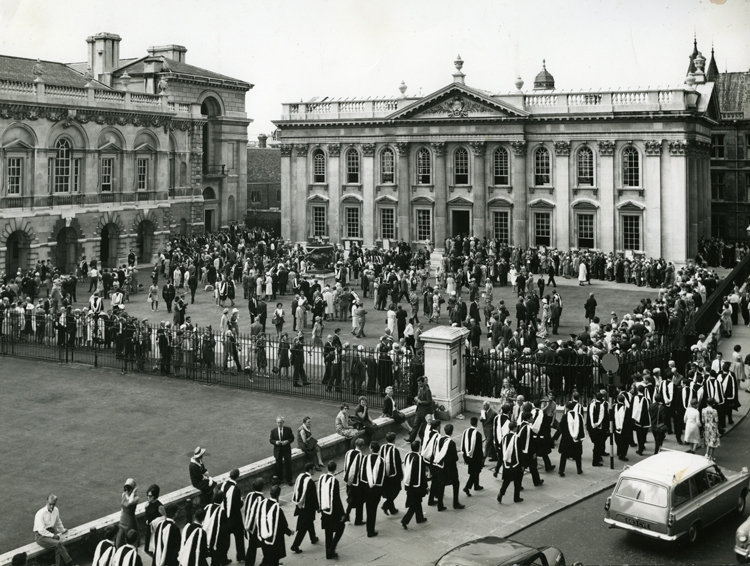 In Cambridge Yellow Pages 1984 they described themselves as “The University Photography Specialists”. In 1990 had a Studio at 17 Mercers Row Cambridge associated with the name of Keith E.Choda LMPA, ABIPP. The Manager was, at one point, Stan Robertson, who became a photographer adter the end of WW2 when he left the RAF. Stan Robertson became an associate of the Master Photographers Association in 1963 and was, in 1986, the National President of the Master Photographers Association (Cambridge Evening News 26 April 1986). In the 1995 Cambridge Yellow Pages their advertising mentioned photographers Peter Lofts ABIPP and Ian Bethell LMPA, also contact Keith CHODA ABIPP, AMPP at 17 Mercers Row Cambridge. 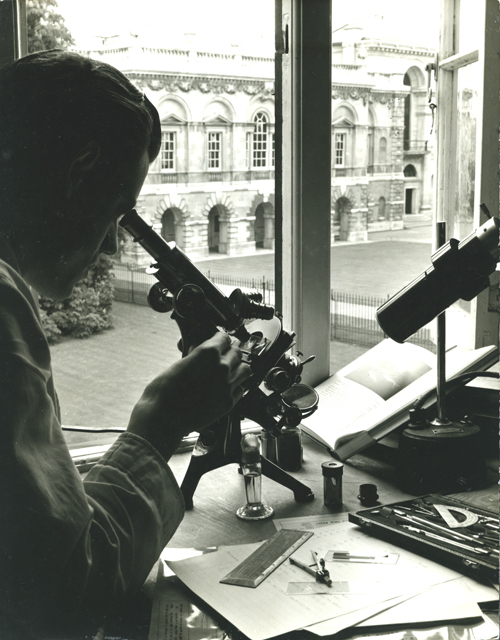 References: Kelly's Directory of Cambridge 1964, - 1970. Cambridge Yellow Pages 1983 - 2000. Subjects, styles, advertising, other relevant information: At the time of his marriage at Bow Middlesex in 1884, James was described as a "coal agent". In the 1891 census James was living at 13 Abbey Road Cambridge and was described as a "photographer's agent". He was living with his wife Emma (b:1847 St Ives Hunts), daughter Milly (b:1875 Kent) and son Ernest (b:1889 Shelford Cambs). In 1892 James was listed as a photographer in the Kelly's Cambridgeshire directory. In 1901 James and Emma were at Blenheim Crescent, Kensington and James was described as a "photographer's agent". In 1911 James and Emma were living in Bayswater at 17 Colville Terrace. James was described as a "commercial traveller".